Don’t you love one pot meals? 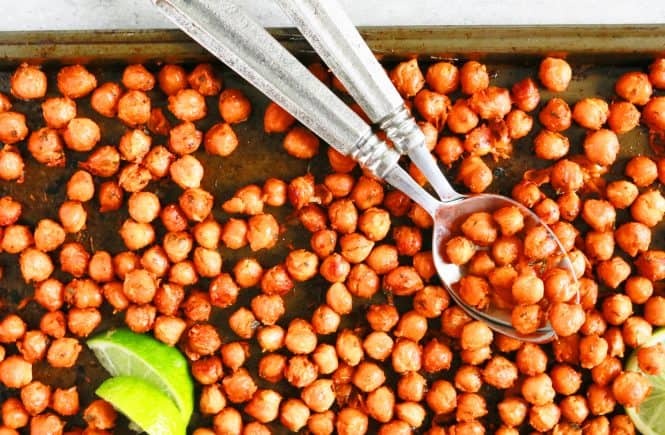 Simple, easy yet delicious weeknight meals. It all began with this Instant Pot Chicken Fried Rice. 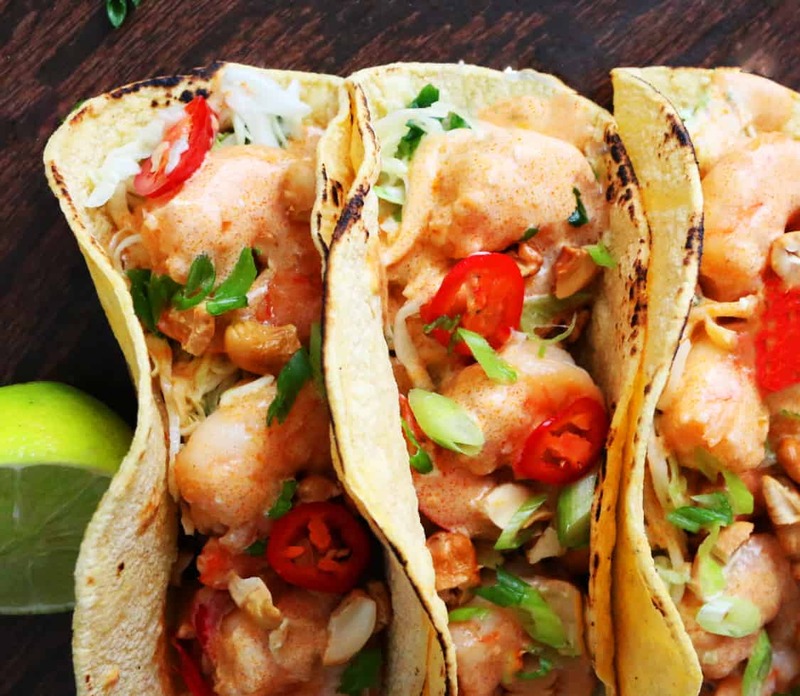 You guys have been loving this recipe so much that I wanted to create a shrimp version! Why is shrimp perfect for weeknight dinners? They are always stocked in the freezer. Instant pot shrimp recipes are so amazing—> Shrimp cooks quick + Instant pot quick/easy = Winner! I love to make fried rice in Instant pot. No planning ahead for leftover rice! Step-2: In the now empty pot, cook peas until thawed, transfer (YES, you use the instant pot to thaw frozen peas as well!? Step-3: In the now empty pot, cook shrimp in a single layer, just until 75% done. Cook shrimp in batches without overcrowding the pan. Step-4: Add some more oil, saute onion and garlic until translucent. Step-5: Add rinsed and well-drained rice and saute for 20 seconds. Stir in water, carrot, shrimp, salt and pepper (not peas and eggs). Cook in manual for 3 minutes. Step-6: Let it hang out in warm mode for 10 minutes. Stir in soy sauce, sesame oil, scrambled eggs and peas. 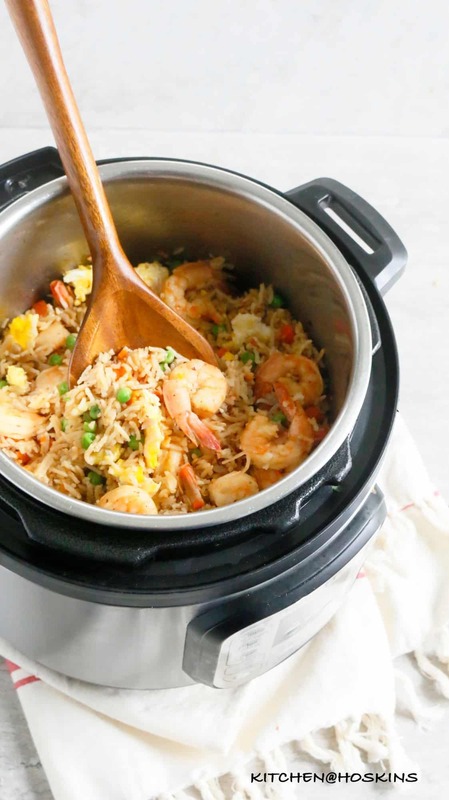 Why is this shrimp fried rice instant pot gonna be your family favorite? Love shrimp? Then click here for more shrimp recipes. Can I make Gluten free shrimp fried rice? Rice is gluten free. So you just need to make sure that the soy sauce is gluten free. Like Tamari soy sauce! 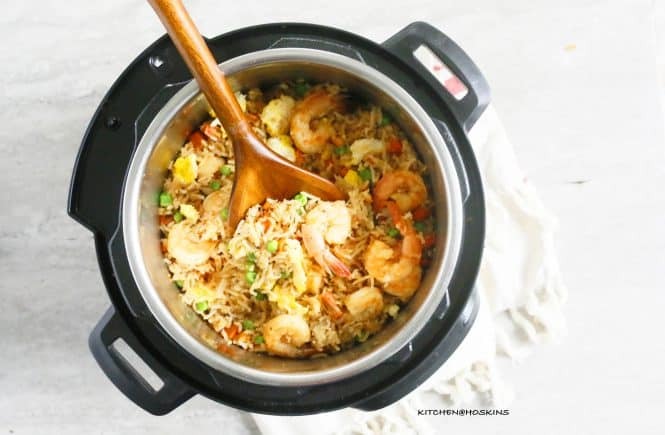 Can you instant pot shrimp fried rice without vegetables? Yes. Divide shrimp fried rice into quart size zip lock bags, seal well and freeze for up to 2 months. To reheat : Thaw overnight in refrigerator. Heat a tablespoon of oil in a skillet, cook, stirring occasionally until warmed through (about 5 minutes). Shrimp : Use raw, cleaned shrimp with tails intact. 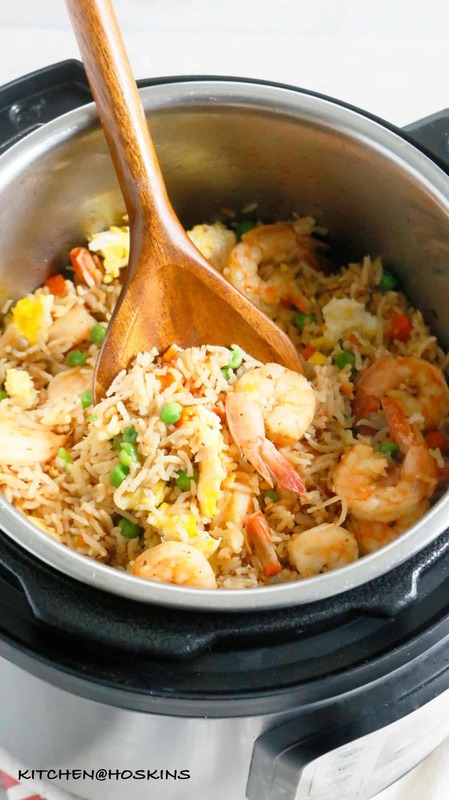 Since we are not using any kinda stock in this recipe (like this instant pot chicken fried rice), the tails add more flavor when cooked along with rice and that means a flavorful shrimp fried rice in instant pot. Cooking shrimp with rice – If you happen to go through the recipe, the shrimp is cooked in two steps: A quick sear and then cooked along with rice. 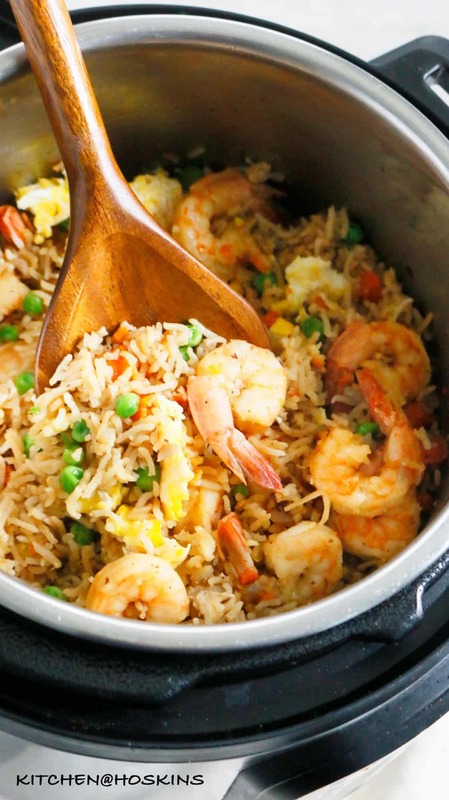 This two step cooking method might not be the norm, since shrimp can be fully cooked in just couple of minutes and then finally stirred into the cooked rice. 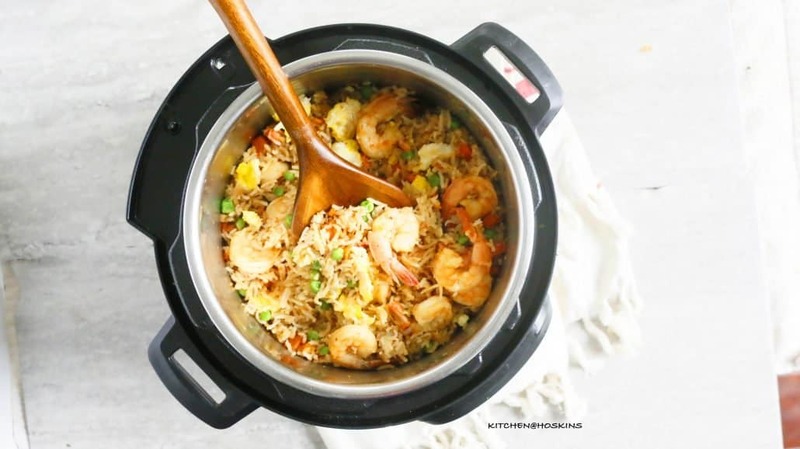 But, when cooked according to this pressure cooker shrimp fried rice recipe, shrimp gets so tender since it is pressure cooked and it flavors the rice beautifully, since it is technically making a shrimp stock when cooking in the instant pot. Cooking rice – you wanna a rinsed and WELL DRAINED rice for this recipe. Since any amount of excess water can overcook the rice. My favorite method is to rinse the rice in strainer, and let it hang out for few minutes so the water can drain totally. 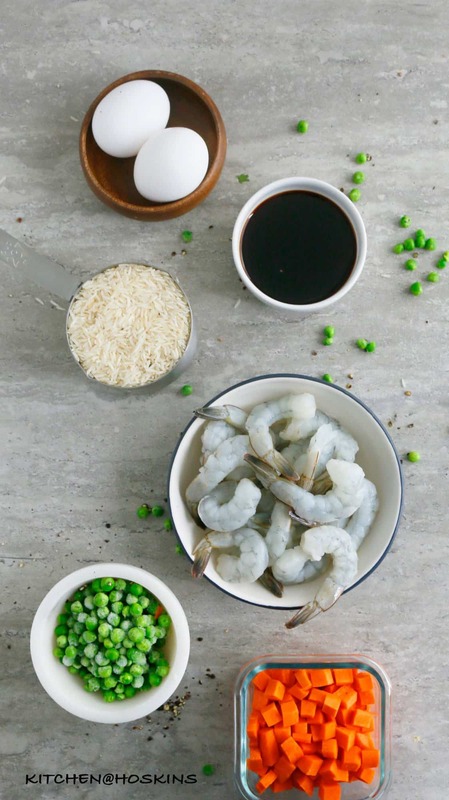 Thaw frozen shrimp – Place shrimp in a large bowl and fill the bowl with cold or room temperature water. Let it sit for about 10 minutes until thawed (the time will depend on the quantity of shrimp). Drain shrimp and pat dry with paper towels. 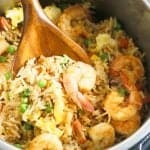 How to make non-mushy shrimp fried rice in Instant pot? It totally depends on your rice, yes! Many, many readers have had huge success with this recipe and there are a few who have had mushy rice. Reason? it depends on the basmati rice you are using. Not all brands, packages of rice are the same though they all say basmati rice in the package —> Some need more water and some less. Some need more cooking time and some less. How do we solve this? I came up with two different cooking methods for you (you are welcome!). So, which method is right for you? If you have tried this recipe already and you have had great success. Just stick to this. If you cook different rice recipes in your Instant pot and use the rice setting and love the way the rice gets cooked , then this is right for you. If you have tried this recipe before and had a mushy outcome, then go for this. Another important note for cooking rice in instant pot —–> It depends on the size of your Instant pot. I tried making this recipe in a 3-quart Instant pot and a 8-quart Instant Pot. Result? Fried rice in 8-quart was much more firmer that the 3-quart. So, if you a own a larger Instant Pot, then use that for firmer rice. Instant Pot Pesto Rice – A super simple, easy, one pot meal! This Instant Pot chicken pesto rice is packed with flavor with bites of chicken, green beans, garlic and basil pesto. Perfect for busy weeknights. Instant Pot Pasta with Tomato Cream Sauce (no cream) – So creamy, so rich, so amazing yet so much healthier Instant pot no-cream pasta with tomato cream sauce. You will never miss the cream! Add frozen peas, cook until it is thawed and all the water evaporates (try scraping the pan to remove any eggs sticking to the bottom). Transfer peas to the plate. Add remaining oil and then stir in chopped onions and garlic, cook (stirring occasionally) for another 1-2 minutes. Add rinsed and drained rice and saute for about 20 seconds (this step helps in rice not get mushy when cooked) and then stir in cooked shrimp, water, carrot, salt and ground pepper. Scrape sides, close Instant pot, lock lid, set valve to sealing, press cancel. (Refer notes below to see which method is right for you). Cooking Method-1 : Select rice mode. (This is an automatic setting and mine took 12 minutes). When cook time is done, let the Instant pot be in warm mode for 5 minutes. When 5 minutes is done, turn valve to vent and let pressure release.Press cancel and open lid. Stir in cooked eggs, peas, soy sauce, sesame oil and ground pepper with a large fork. Cooking Method-2 : Cook for 3 minutes on manual mode. When cook time is done, let it be in warm mode for 10 minutes (for al dente rice) and 15 minutes (for more softer rice) When cooking time is done, turn valve to vent and let pressure release.Press cancel and open lid. Stir in cooked eggs, peas, soy sauce, sesame oil and ground pepper with a large fork. Remove pot insert from the instant pot base and place on a wire rack to cool for 5-10 minutes, before serving. 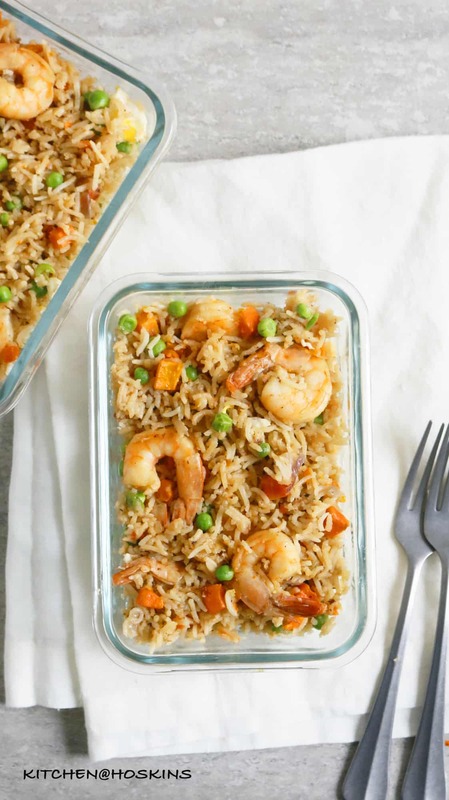 Serve instant pot shrimp fried rice hot or let cool and pack into containers to meal prep. 1.Which cooking method is right for you? If you are not sure about your rice or cooking method. 2. Another important note for cooking rice in instant pot —–> It depends on the size of your Instant pot. - I tried making this recipe in a 3-quart Instant pot and a 8-quart Instant Pot. Result? Fried rice in 8-quart was much more firmer that the 3-quart. So, if you a own a larger Instant Pot, then use that for firmer rice. 3.Rice - any long grain white basmati rice can be used. Rinse rice in a colander until water runs clear. Let it hang out in the strainer at least for 5 minutes, to drain almost all the water. 4.Shrimp - Using shrimp with tails attached adds more flavor to the instant pot shrimp fried rice. If you don't have any, then use shrimp with tails removed. 5.Salt - is a personal preference. 1/2 teaspoon salt was perfect for this recipe, but use as per your taste. 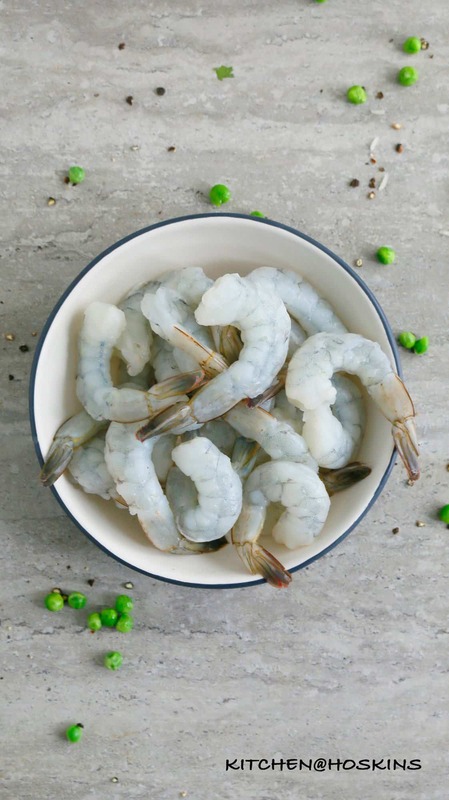 6.Thaw frozen shrimp - Place shrimp in a large bowl and fill the bowl with cold or room temperature water. Let it sit for about 10 minutes until thawed (the time will depend on the quantity of shrimp). Drain shrimp and pat dry with paper towels. 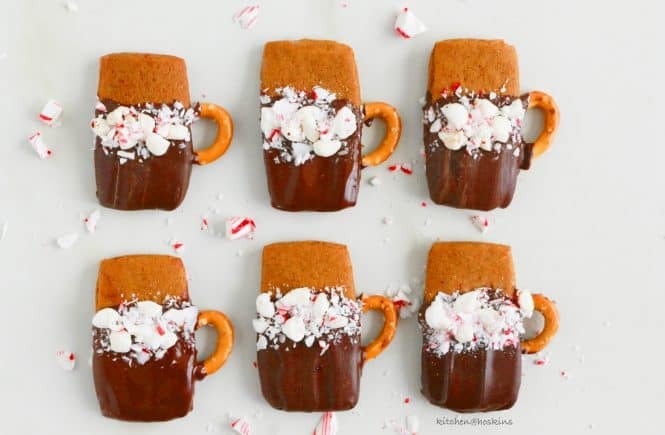 This looks yum, thanks for sharing! We don’t eat rice. Any suggestions for cooking time variations if I swap out rice for cauliflower rice or quinoa? Hi Sarah, If using cauliflower instead of rice, then you can make this fried rice in the stovetop, since cauliflower does not need to be cooked in an instant pot. If using quinoa, then proceed step 1 and 2 as is in the recipe. In step3, add rinsed 1 cup quinoa, 1 1/2 cups water, cooked shrimp, salt & pepper as required and carrot. Cook on manual for 1 minute and then let it be in warm mode for 10 minutes before releasing pressure. Open lid and proceed on to step5. I made this recipe last night and the rice burned to the bottom before the Pot came up to pressure. I am thinking that I lost too much ch of the liquid while “deglazing” the bottom of the pot. Any suggestions? This was an interesting find tonight searching for something to prepare for dinner. I made it and it came out perfect! Nice flavors, rice perfect using the rice setting. Will definitely make again! Hi Sarah! I want to apply your recipe. I have allergic to shrimp. What can I take instead of shrimp? Thanks for amazing sharing.